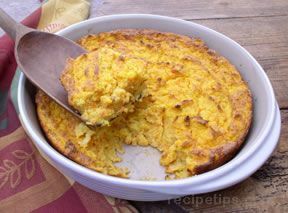 Pureed butternut squash adds delicious flavor to this fantastic, old-fashioned cornbread favorite. 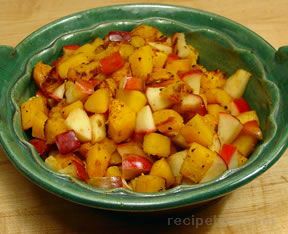 COOK SQUASH: Cut squash lengthwise and remove seeds. In a lightly greased casserole dish, place squash flesh side down and bake at 400º F for 45 minutes, or until tender. 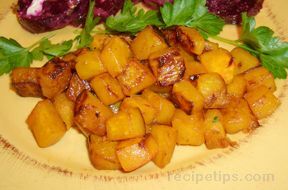 Cool slightly, remove squash from skin and purée. 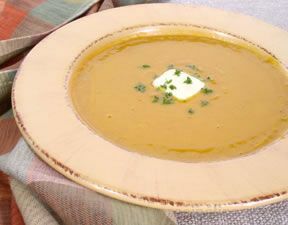 Cook carrots and purée. Lower oven temperature to 375º F.
SPOON BREAD: In a 3 quart saucepan, sauté onions in 1 tablespoon of butter until translucent. Add water, 1/2 cup milk, and rosemary. Bring onion mixture to a boil. Whisk in cornmeal. Cook, stirring constantly, for an additional 1 minute. Remove from heat. To create the batter, combine the cornmeal mixture, puréed vegetables, remaining 1/2 cup of milk, egg yolks, 2 tablespoons butter, salt, cayenne, and cumin in pan. Beat egg whites in a separate bowl until stiff peaks form. Fold into batter. Place in greased 2 quart casserole. Bake at 375º F for 45-50 minutes, or until set. The center should be soft; do not overbake. Spoon bread is served hot, as a side dish, using a spoon. "I’ve been trying to find something to serve for Thanksgiving in place of stuffing and this is it. I made it last night and thought it was perfect. Great recipe!"